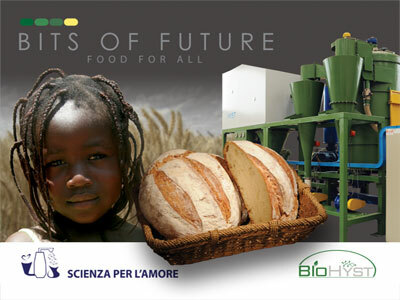 The official presentation of “Bits of Future: food for all” – a humanitarian venture directed toward African countries based on the use of Hyst technology – took place in Rome on March 2nd 2011 at the Sheraton Golf Hotel. By donating machines and products obtained from Hyst processing, the project aims to achieve food security and sustainable development in the target countries, at the same time encouraging local participation in all the activities. The official Rome event presented “Bits of Future” to the African countries interested in the project, to humanitarian and scientific organisations, potential industrial partners and the international and national media. After the excellent results obtained with raw materials widely available in Europe, the humanitarian project intends to proceed by experimenting with the biomasses available in African states and then installing in situ the first Hyst machines for processing these local biomasses. Representatives of several African governments were present at the meeting. Apart from Senegal – the first country to accept the invitation from BioHyst – also Burkina Faso, Ghana, Ivory Coast, Somalia, Mozambique and Puntland were present. Also present on March 2nd were representatives of the UNIDO (United Nations Industrial Development Organization), the IFAD (International Fund for Agricultural Development), the ENEA (National agency for new technologies, energy and sustainable economic development) and ITALMOPA (Italian association of millers and pasta makers).